Tile’s various Bluetooth trackers are among the best in the business. Of that there is no question. They’re also among the priciest in the business though, which is why lower-cost alternatives have become so popular recently. Not every Tile rival includes all of the features that make Tile’s trackers so popular though, and the company’s newly updated Tile Sport Anything Finder is a perfect reminder. Most Bluetooth trackers require the user to be within about 30 to 50 feet in order to locate the Bluetooth tag, but the Tile Sport works from up to 200 feet away. 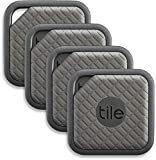 That kind of performance comes at a price, but Amazon has a killer sale going right now on Tile Sport 4-packs that drops the price to about $18 a piece. Definitely get in on the action while you still can. Find your phone: double tap the button on your Tile Sport and your phone will begin to ring -even on silent. See it on a map: the Tile app remembers when and where you left something behind.